If the last game meant very little, than this game means even less. 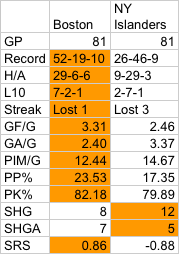 The Islanders are locked into the worst place in the league, meaning they get one of the top 2 draft picks this year. Bruins are locked into top in the east, won't get passed in the league standings and won't be passing the Sharks. Seriously, this game will not change anything if the bruins win, lose, tie, or don't show up. My hope is that nobody gets hurt and the Bruins stay under 200 goals against this year. That means fewer than 5 goals against today. The islanders have scored 4 goals in 3 games against the Bruins, but the Bruins might just sit in the locker room for the season. Rangers/Flyers: Flyers are playing the Penguins in the first round. If the Flyers get to OT or win, they get home ice. If they lose in regulation, Pens get home ice. Go....Rangers? Blues/Avalanche: Blues win and they leapfrog to 6th place and face the Vancouver Luongos. Lose and they stay in 8th and play the San Jose Sharks. Overtime doesn't matter in this game. I don't care much about who wins this one.